Pop. 312. In Hodgins T., Algoma Dist., on Hwy 532, 49 km NE of Sault Ste. Marie. The place was first known as Goulais. When the post office was establIshed m 1903, the community was named after hotel owner Peter Searchmont. Pop. 588. In Algoma Dist., in the NW corner of North Ch. 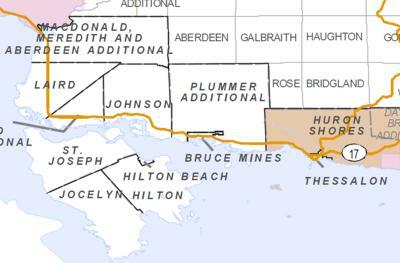 of L. Huron and the mouth of Garden R., on Hwy 17, 15 km E of Sault Ste. Marie. The name Garden River is a translation of the Ojibwa word ketaguanaseebe. Pop. 793. 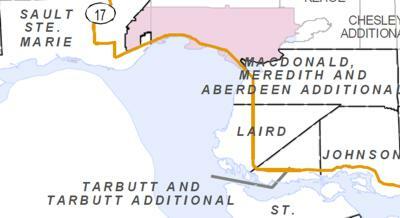 In McDonald T., Algoma Dist., on L. George, a part of the channel between Ls. Huron and Superior, on Hwys 17 & 638, 24 km. E of Sault Ste. Marie. Pop. 339. In FenwickT., Algoma Dist., at the mouth of the Goulais R., at L. Superior and the W. terminus ofHwy 552, 40 km N of Sault Ste. Marie. Pop. 298. In Johnson T., Algoma Dist. on the North Ch. ofL. Huron and Hwy 17, 45 km. SE of Sault Ste. Marie. Immediately S of Hwy 17, on Hwy 548, 40 km. SE of Sault Ste. Marie. This 24-by 30-km. island is in the mouth of the St. Mary's River, connected to the mainland by causeway and bridge.